(1) Internet: One TI-84+ connected to an Arduino and my laptop, demoing a guestbook application that geekboy1011 and I designed and wrote together. Visitors could go to a webpage on a netbook or their smartphones, sign with their state, email, and a brief message, and that information would appear on the TI-84+'s screen. Each message was transported from the guestbook webpage onto the IRCHub gCn hub via a Guestbook gCn bridge, over gCn and CALCnet to the target TI-84+, and then displayed on the target calculator via an ASM program written by geekboy. 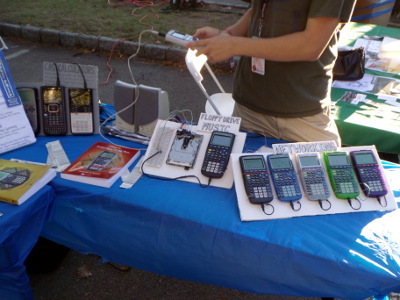 (2) High School Math, Coding, Games: A regular TI-84+SE, a pink TI-84+SE, a Cemetech-emblazoned Casio Prizm, and a TI-84+C SE, all loaded with the most popular programs and games. These four calculators were meant to demonstrate the state-of-the-art that most budding calculator programmers in school would be working with. (3) Written Resources: "Programming the TI-83 Plus/TI-84 Plus" and "Using the TI-83 Plus/TI-84 Plus", as well as explanations of the various online tutorials and communities available. (4) CAS Calculators: A TI-89 Titanium, TI-Nspire CX CAS, and HP Prime, demonstrated the latest CAS calculators available for college, graduate school, and professional users. These served the dual purpose of representing the high-end of calculator capabilities, and exemplifying calculators that aren't the focus of as much hacking effort. (5) Ultimate Calculator 2: The (in)famous blue calculator with racing stripes, a PS/2 port, a touchpad, and an RGB backlight. I took it apart to show both the front and the back, and added its mouse on the side. (6) Calculator Music: A TI-84+SE and computer speakers, playing the best of Qazz42's sequencing work using mobileTunes 3.1 and Doors CS 7.2. (7) Floppy Drive Music: A TI-83+, a floppy drive, and a solderless breadboard demonstrating floppyTunes with a sequencing of "Clocks" by Coldplay and "I Am The Doctor" by Murray Gold. A lot of people said they saw the demo on YouTube. (8) Networking: Five TI-83+ calculators running the Flourish demo over CALCnet 2.2 and Doors CS, to demonstrate that graphing calculators can be networked together. This was the most popular of the eight in terms of eye candy, and used five different types of TI-83+. :: Brian Benchoff of Hackaday stopped by, and we chatted about what kinds of cool hacks we could do next. True carbon-fiber TI-84 Plus C Silver Edition case, anyone? Although we didn't have anything ground-breaking for him to cover, we did get some great swag, including that Hackaday shirt I'm wearing below. :: Untapped Cities, a New York City blog, posted an article entitled "10 Gadgets from 2013 NYC Maker Faire You Didn't Know You Needed". Our calculator networking and internetworking projects, CALCnet 2.2 and globalCALCnet, are #2.
:: We saw how young kids immediately would jab at the calculators' screens, assuming that any screen on a small device must be a touchscreen. GT Springer from HP made the same observation when we interviewed him. We also had current students who asked us about putting programs and games on their calculators, and others who wanted to know how they could learn more about calculator programming. We had many TI-84 Plus C Silver Edition owners who wanted a shell and/or programs and games. 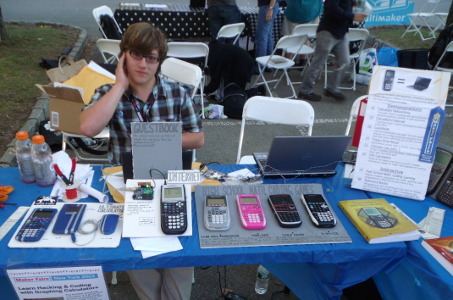 :: Like last year, we spoke to many young and old adults who reminisced about exploring hardware and software hacking with their own graphing calculators, way back when. Thanks to everyone who stopped by the Faire, and thanks especially to my dedicated helpers for volunteering their much-appreciated time. 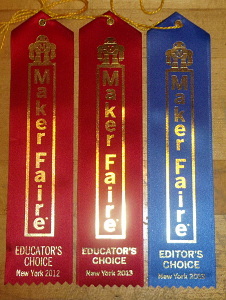 I hope we'll be able to make it three years in a row at World Maker Faire 2014, and I hope I'll be bringing more of the Cemetech staff with me next time! Did you see us there? Any thoughts on the exhibits we showed? Let us now in the attached thread. If you want to join us next year, please also let us know. 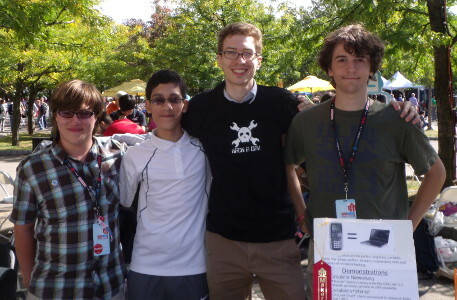 Left to right: Tim "Geekboy1011" Keller, Alec "Qazz42" Szigeti, Christopher "Kerm Martian" Mitchell, and Thomas "Elfprince13" Dickerson; Maker Faire 2012 Educators' Choice, Maker Faire 2013 Educators' Choice, Maker Faire 2013 Editors' Choice. We also had about a 30 minute visit from Stephen Wolfram, of Mathematica, MathWorld, and WolframAlpha fame, who had some questions for us about why someone might purchase a CAS calculator (as oppposed to using one of his products), and about what makes a good UI from the perspective of calculator users. Do we know when/where the video of your interview will be posted? Also, any chance of a couple of the other pictures going up on Facebook? Yes, that was quite an interesting conversation. I hope something comes of it. I suspect the video will be on this page. I will indeed post up a bunch of photos on the Cemetech Facebook page. I wonder if he knows about ElectronicGeek's WAti project. Seems like you guys had a lot of fun. Hope you guys also got a nice laugh over my caps-lock tirade. He didn't before, but does now. Sounds like another successful showing, well done guys . Thanks! It was a lot of fun, and I hope we inspired a lot of people young and old to realize the capabilities of their graphing calculators. A TI-84+SE and computer speakers, playing the best of Qazz42's sequencing work using mobileTunes 3.1 and Doors CS 7.2. Where could I download more mobileTunes music than is included with mobileTunes, anyway? Qazz has quite an extensive library of music that he has created for it; at Maker Faire, he said he would put some effort into packaging and releasing the music. OK, great! Because you see, I actually do sit around listening to music on my graphing calculator - for enjoyment! It's almost like electronic or techno. Where can I get the music of Qazz42 for my calc? You can keep nagging him about it and posting in this topic; hopefully he'll see and remember. You can also private message him on Cemetech. Edit: Qazz has updated Qazz's MT3 collection in the Cemetech Archives. As stated here, now that you have successfully nagged me via PM, I have put the effort into updating it. meant to do it earlier, but I kept on putting it off in exchange for more MT3 songs. I have been trying to make a few songs for mt3 lately too. Have to see If Im enterested enough to finish. © Copyright 2000-2019 Cemetech & Christopher Mitchell :: Page Execution Time: 0.112936 seconds.